In 1943, Edgar Clayton and Quinton Claunch got together and formed a group that came to be known as the Blue Seal Pals, with their own radio show over station WLAY in Muscle Shoals, Alabama. The original members of the group included Edgar on vocals and guitar wiht Quinton on electric guitar, vocals and a comic character known as "Washboard". 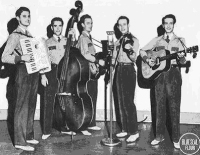 Bill Cantrell and his fiddle joined the group in 1944 while Dexter Johnson became a member in 1945. In 1946, the group expanded its horizons a bit. They moved from radio station WLAY to WJOI in Florence, Alabama. The Blue Seal Network was formed with their sponsor the Columbia Mill and Elevator Company, who made Blue Seal Flour. The network grew to twelve stations in Alabama, Mississippi, Tennessee and Georgia. The group caught the attention of the Solemn Old Judge George D. Hay of WSM and the famed Grand Ole Opry in Nashville, Tennessee. The Judge asked the group to audition for WSM and they were subsequently asked to host The Sun Up Serenade show on WSM on Saturday mornings. Their personal appearances took them all over the southern part of the United States and the East coast. They toured for a time with the Rod Brasfield show. Quinton would play the part of Brasfield's "Gal Susie" and Dexter Johnson played the role of "Doctor" in those shows. Other tours were with Cowboy Copas and with Minnie Pearl on her International Harvester shows. The Blue Seal Pals broke up as the 1940s came to an end. The group sensed that radio was moving away from "live" performances to recordings. Hillbilly-Music.com wishes to thank William W. Love, who's family was part owners of the Columbia Mill and Elevator Company in Columbia, TN that manufactured Blue Seal Flour for providing us with information and details about the Blue Seal Pals and the group members.